Every once in a while we come across a story that really captures our imagination. We’ll never forget when we learned that a farmer in the mountains of Tennessee was growing truffles; not just any truffles, but the prized Black Perigord truffles. These intoxicating gems sell upwards of $800 per pound. Tom Michaels won the President’s American Treasures Award for his contribution to our food culture through his groundbreaking efforts cultivating this black gold. Today, many farmers in the Southeast are planting oak and hazelnut trees inoculated with truffle spores in hopes of taking part in the latest gold rush. Tennessee Truffles was certainly a surprise, but you can imagine our reaction when we learned of Carolina Caviar. This swimmingly good idea may just be the next gold rush. 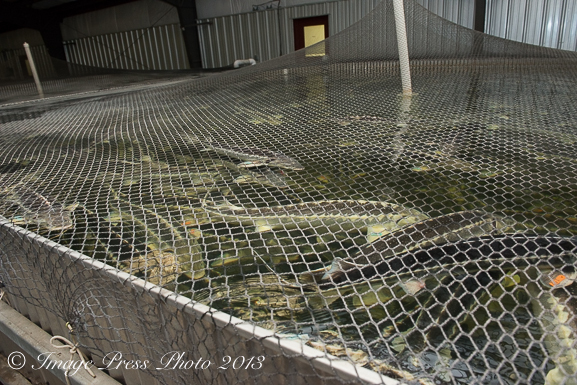 There are several companies raising paddlefish for “caviar” in Oklahoma and Kentucky. Somewhat similar to sturgeon caviar, paddlefish roe sells for a fraction of the price and most of the production is sold internationally. However, unlike Tennessee truffles that compare favorably to the most prized French or Italian truffles, Kentucky caviar (technically, caviar is only from sturgeon) from paddlefish is not the same in taste, size, or texture as Russian and Siberian caviar from sturgeon, though at the price it has its followers. On a recent trip to the mountains of North Carolina, we were led by Executive Chef Nate Curtis of Westglow Resort and Spa to a most unusual business that is sure to influence the culinary world. Hidden in the hills of Happy Valley (yes, that’s really the name of the town) are three nondescript metal farm buildings that shroud it’s real purpose. 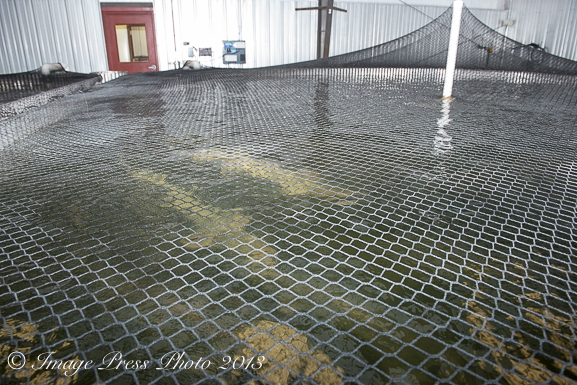 For the past seven years, a small group of investors has built a sturgeon farm with the intent of producing some of the finest caviar available in the world. They began their enterprise in 2006 after Joe Doll, a cargo pilot, became aware of the decline in availability of wild Caspian Sea sturgeon. He enlisted the support of three other partners to build the Atlantic Caviar and Sturgeon Company. Over the years, the partnership has changed with the death of one partner (Bill White) and the addition of two experts in biology and agricultural engineering. 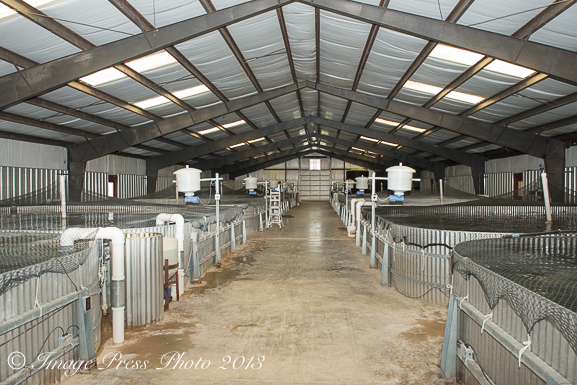 This sustainable aquaculture farm houses four nursery tanks, thirty-two grow tanks, and twelve staging tanks. Each grow tank is 20,000 gallons. 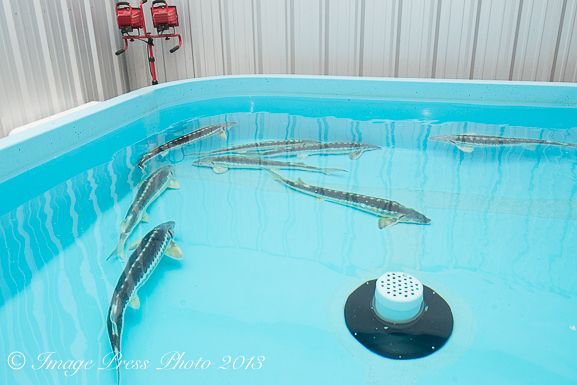 They are raising Russian, Siberian, and recently added Atlantic sturgeon. 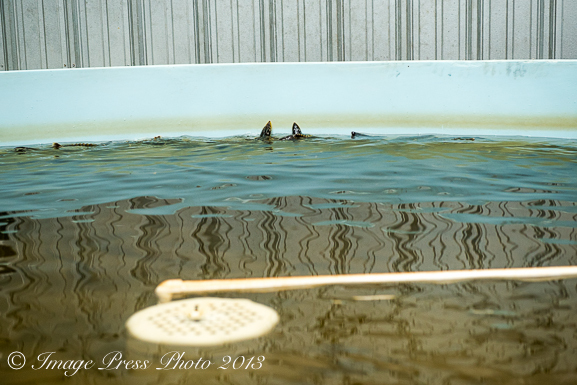 It takes seven to eight years to raise the fingerlings to mature size for harvesting the roe. This is the first full year (2013) of production. 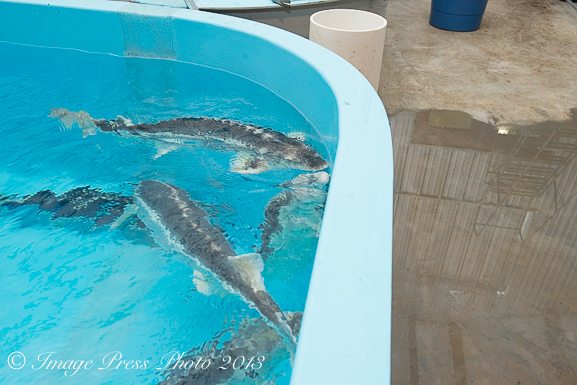 Grow tanks with Siberian sturgeon. They are larger and fattier than Russian sturgeon. A prehistoric survivor of the ice age, sturgeon is the largest freshwater fish in the world, some exceeding 2,000 pounds and resembling an aquatic dinosaur. Ancient Romans thought sturgeon an aphrodisiac with life-extending properties. Henry I of England declared it the “Royal Fish.” Today, because of over fishing, loss of habitat and man-made dams, sturgeon in the wild are endangered and protected. 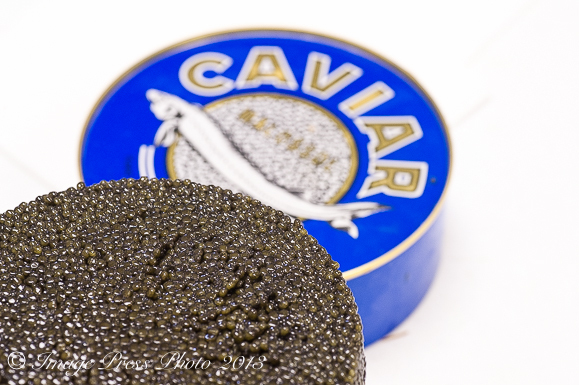 Atlantic Caviar and Sturgeon Company is the only producer in North America of the highly prized Ossetra caviar from Russian sturgeon, second only to the most sought after Beluga caviar. Their Siberian caviar was recognized by two of the most prestigious international purveyors of caviar as one of the top three caviar in the world for taste and color. 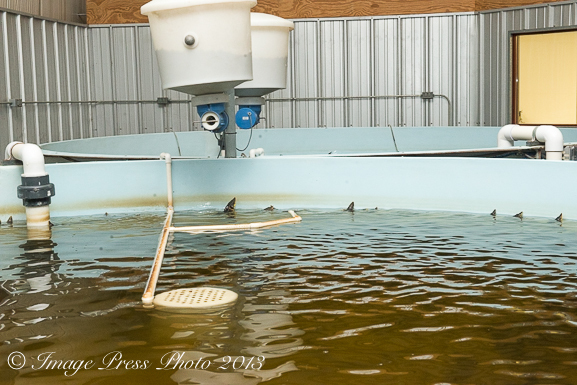 Similar aquaculture businesses are being developed in Uruguay, China, Iraq, and Israel. What makes Atlantic Caviar’s superior is the well water and filtration system used in each tank. Every seventy-five minutes the water in the tank is fully filtered. Great article! I love this product! I have read this post I am very surprised to know that there is a great business of Carolina Caviar production. You have done a great job by this post and I am happy to know all about it. Thanks a lot for sharing this information. I’m surprised that is the article makes no mention of Bill White, the man who funded the entire caviar enterprise at the beginning. Indeed, it is located on Bill’s property. God rest your soul, Billy. Bill White’s name is mentioned in the paragraph under the photo of the grow out barn.